For her Pop-Pop Video series, first exhibited at the Kitchen in New York City in 1980, Dara Birnbaum edited together disparate broadcast footage into fast-paced single-channel videos that comment on the homogeneity of the televisual vocabulary. 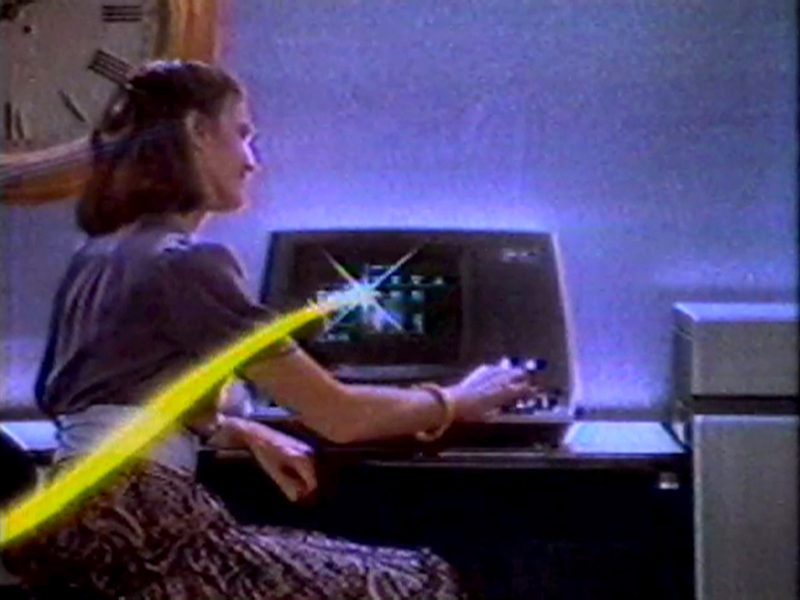 Kojak/Wang crosscuts sequences from the popular crime show Kojak with a commercial for the technology company Wang Laboratories in order to relate the violence of a rapid-fire gunfight to the onslaught of colorful rays going to and from a computer monitor. In these videos, Birnbaum selected paradigmatic television segments and used formal devices of television such as repetition, framing, intercutting, and slow motion in order to reveal a common arena of power, competition, drama, and violence. "Pop-Pop Video: Kojak/Wang." Take It or Leave It: Institution, Image, Ideology Digital Archive. Los Angeles: Hammer Museum, 2017. https://​hammer.ucla.edu/​take-it-or-leave-it/​art/​pop-pop-video-kojakwang/​.